Hello readers. I know that Mrs. FixIt has a larger following on this blog than I do. I have the opportunity to work with a Startup being developed at Northwestern University. The company is called SWITCH. We are frustrated with the state of home automation and would like to Fix It. The future depicted by the Jetsons way back in the early 60s is still far out. We have phones that remind us to pick things up from a store when we pass by the store. We can have music services play music based on our mood. You can buy something online and have it on your door the next day. We can carry a 1000 books on a device the size of a small notepad. Why is it so difficult and expensive to automate or integrate systems in my home? iOS and Android opened up a whole new opportunity for making our phones smart. Our phones have become an extension of ourselves. SWITCH plans on developing a platform to make a similar opportunity where developers can create apps to work with integrated components in the home. The potential is limitless. If interested, please take a moment to fill out the survey. At the end you can register to win a $50 gift card from Amazon. It's probably a little early to be talking about a baby registry. But, I'd be lying if I said that I didn't have a registry set up before we were expecting. I'd actually recommend it if you're in the phase of thinking about babies. Amazon allows you to set up a "private" registry (totally unsearchable) and you can start to make an active list of items that you have heard about/noticed/seen on blogs, etc. Wait, only I had been making incessant mental notes? Quite possibly. The other contributing factor to my baby product knowledge/love-fest is my work experience in the baby industry. First, as a nanny (I've driven every stroller around!) 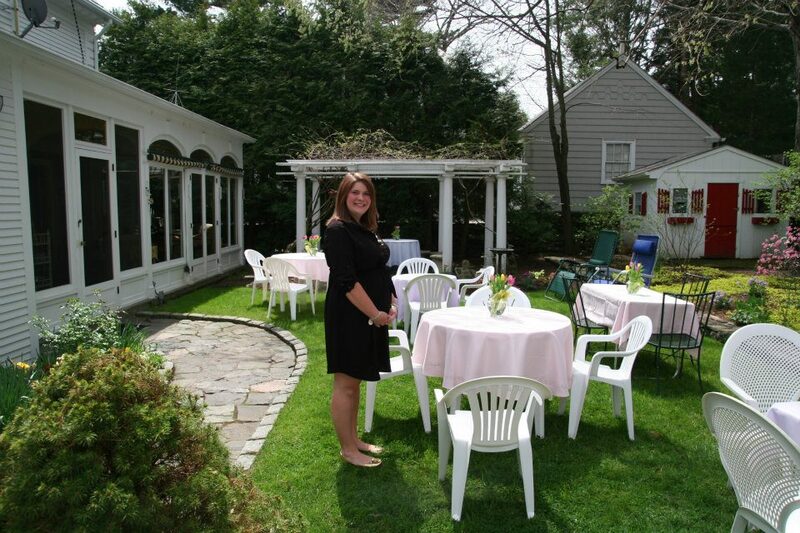 and second, as a maternity concierge. So, being a researcher and tester, I have a lot of opinions on what I like and what I think is junk. Plus, I've been lucky enough to attend product expos where I was able to meet manufacturers directly and get a feel for the people behind the product. 1. Motorola Video Monitor: I really balked when video monitors first became popular. How lazy can people be? Plus, we live in a one-story condo, so hearing the baby will never be an issue. We probably don't even need a monitor at all. However, I changed my mind when I began to hear parents RAVE about being able to peek in on the baby or being able to check on whether they're just stirring or full-out awake. (I've definitely gone in to check on a baby before only to wake them from a nap. Once they hear that door creak, their eyes pop right open and there's no turning back.) I also figure that the monitor will be good to have when traveling. My parents live in a house where it would be hard to hear a baby crying from upstairs, so for visits this type of monitor seems to make a lot of sense. 2. UppaBaby Vista: My favorite stroller on the market. I could write a novel about all the things that make this stroller the best one out there, but I'll stick with the basics. It can expand to accomodate 3 children, it handles beautifully, UppaBaby is an unbelievably good company, it's versatile, sturdy, the under-basket can hold GOBS of stuff, and it's especially awesome for tall parents. I have dealt with many strollers in my day, UppaBaby wins. 3. Boon Flair High Chair: I was torn on high chairs. People rave about the Stokke Trip Trapp (or similar Keekaroo), and I agree that they're pretty great. However, I was sold on the Boon for a few reasons. I love that it can adjust to different heights - it can pull up to a table or countertop - and also that it's on wheels. Being able to slide a baby around in a high chair is a wonderful feature. Baby can sit safely while you prepare dinner in the kitchen, you can roll back to the dinner table, or you can pass baby between parents when one needs a break from feeding. Plus, the Boon has no crevices - it comes in one large "part" thus making clean up WAY easier. No hidden crumbs! I have definitely found old, crusty food in traditional high chairs. Icky. 4. Peanut Shell Sling: I LOOOOOOVE wearing babies in slings. It's the most comfortable carrier style for my body, and I adore having a sleeping infant all curled up in there. I also like being able to carry a toddler on my hip while also being hands-free. I've also registered for a traditional carrier (specifically the Becco Gemini) but I find I get less sweaty and remain generally more comfortable using slings. This is quite possibly the item I'm looking forward to most! 5. Bjorn Baby Sitter Balance: Babies love this thing. I haven't had tons of experience with babies being ALL about the bouncy seat, but I've heard this one is top notch. I actually didn't even have a bouncy seat on our registry at first, but then heard over and over what a great piece the Bjorn Baby Sitter was to have - especially while Mommy takes a shower or needs a minute to get something done. 6. GoCrib: I'm not a fan of the Pack N Play. I don't know what it is that bothers me about them exactly, but I really don't want one in my life. The GoCrib is similar, but a distinct alternative. It's more like a travel crib for little ones - extremely portable, lightweight, and versatile. It's won several awards in the past few years, and parents seem to love it. You can take it to the park! The beach! On a weekend vacation! If you're not convinced, go to the website and check it out. I'm sure a lot of you new moms are going to tell me about the advantages of having a Pack N Play - I hear you. However, our living space is small enough that it simply doesn't make sense, and we're not planning on having baby sleep in our bedroom. What did you love most for your little one? 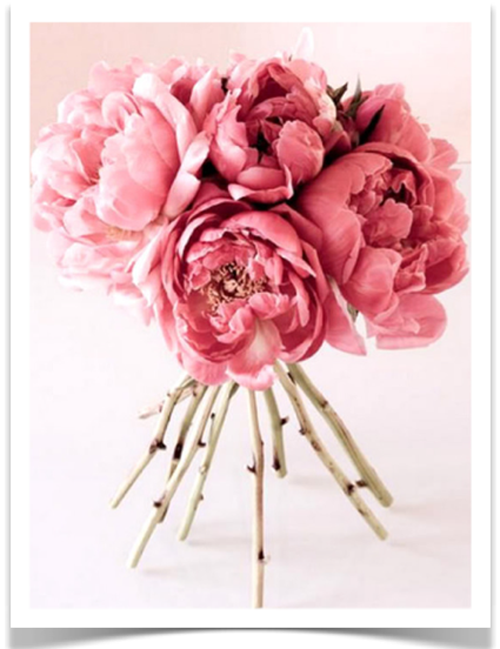 Do you have an all-time favorite product? Do you know what this week means, friends? We are officially caught up! 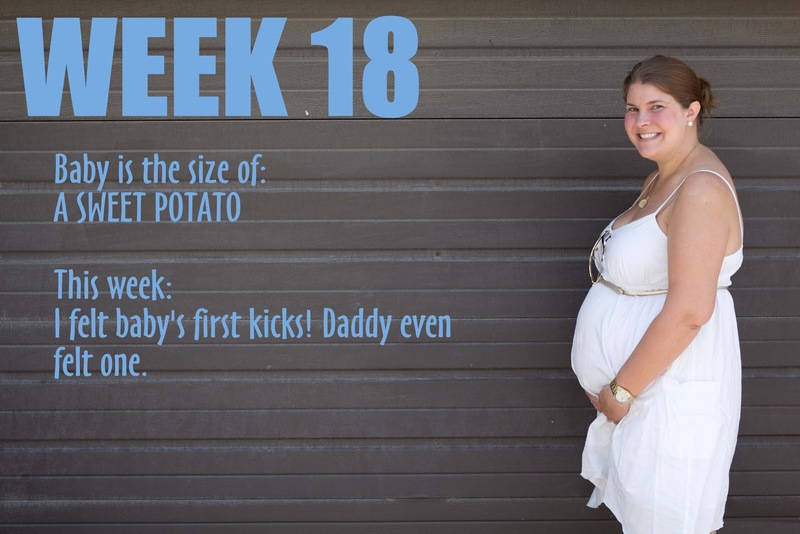 I'm technically in my 19th week right now, and these posts recap the events of the previous week. I was starting to think we would never get here, but we made it! After my not-so-favorite series of events last week, week 18 more than made up for it. On Thursday evening I was driving home from work and felt the baby kick! It was a quick, obvious little pop just below and to the right of my belly button. Then a few moments later, two more little kicks close to where the first one was felt. The next day I noticed a few more while sitting at my desk. Eeeep! The baby was really kicking! Mr. Fix-It was also excited, but a teeny bit jealous that baby and I were getting to have such a fun interaction. He was in Boston for a few days last week and felt extra far away. I told him I didn't think he'd be able to feel any baby kicks for a few more weeks, but surprise!, he was able to feel some just a few days later. Something kind of not-awesome did happen this week. While driving to work one morning I got rear-ended. It wasn't bad AT ALL - we were actually excited about finally getting some work done on our slightly beat up bumper - but yeesh! This kind of thing makes you realize that you can do your best to stay safe and healthy but sometimes life just gets you. Thank goodness it wasn't worse. All in all, things are great. I've been feeling like myself - no crazy cravings, no real "symptoms", just a growing belly! Keep doing your thing, baby! 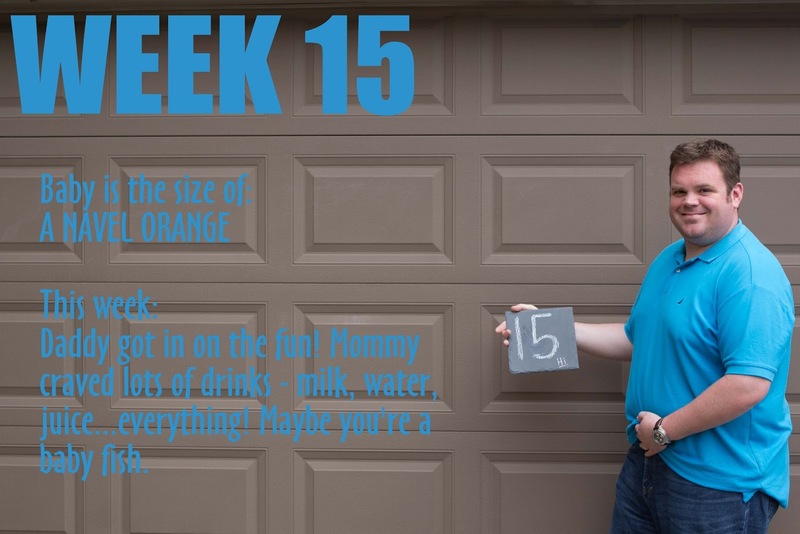 Week 17 was my least favorite BY FAR. Anxiety is never pleasant. Anxiety about your baby and knowing there's nothing you can do - the worst feeling I could imagine. Late last week I was at a conference. During one of the breaks I used the restroom. And discovered I was bleeding. I quickly called my doctor expecting her to tell me to go home, rest, and to call if it got worse or if anything changed. Instead, she told me to immediately head to the ER and ask for OB Triage. That's when I started to get nervous. I grabbed my stuff and bolted. I called Mr. Fix-It, and he decided he was going to meet me at the hospital. I got situated and a nurse asked me a bunch of questions about what was happening. Then nurse-in-training-I'm-dumb-as-rocks tried to find a fetal heartbeat. She gently rubbed the doppler over my belly for what felt like an eternity. Reality: 5 minutes-ish. She could tell I was starting to get anxious, reassured me "this happens", and then I firmly suggested that it was time for an ultrasound. She pulled out the wand-thing and again began aimlessly moving it around. "My doctor pushes A LOT harder" I informed her. The first nurse came over, pushed the wand more firmly and POP! baby on the screen. I stared. Praying to see movement. Baby started moving, and the nurse pointed out that baby's back was facing out. She found a strong and steady heartbeat. THANK GOD. Then she did an exam and concluded that she had no idea what caused the bleeding. I took this as good news, but sometimes answers are nice. Ultimately, the whole incident was rendered a fluke and I was told that everything looked as it should. I was unbelievably relieved, but also had terrible feelings of anxiety over the next several days. What if something really had been wrong? What if they missed something? What if? What if? Fortunately, I'm feeling significantly better now and I have a follow up appointment "just to make sure" next week. This motherhood stuff can really knock you for a loop, but it also keeps you focused on what's most important. Week 16 brought Mother's Day! I have to say, I was a bit sentimental and spent the day imagining what life will feel like a year from now. Mr. Fix-It and I spent a lot of time driving between family's homes, and all I could think about having a car seat behind me! I really can't wait to meet this little one. I've still been feeling great, and I'm starting to wonder when I'll really feel pregnant. You know that bizarro show "I didn't know I was pregnant"? At 16 weeks, I could make an argument for those women. I feel completely like myself and don't have any strange symptoms, cravings, or feelings. Sure, I'd probably have noticed that I'm awfully thirsty lately, but that would also easily explain the frequent bathroom trips. Oh, and the belly. It's definitely growing, but not huge. In plenty of outfits when I'm not standing sideways it really isn't obvious. Call me crazy, but I'm still looking forward to feeling like I've officially "popped". I'll report back when it happens. 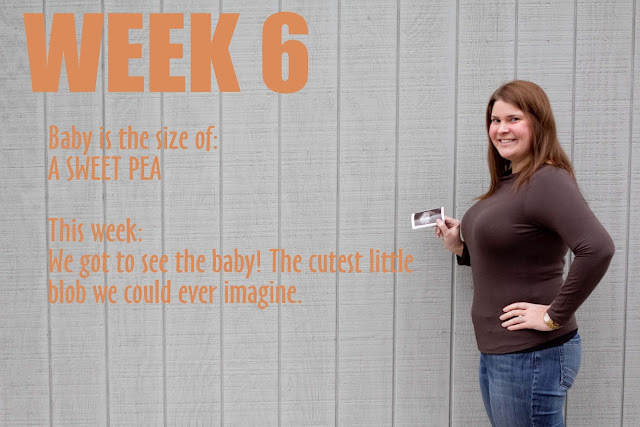 So, anyway, I'm starting to understand how people could go a while and not realize that they were pregnant. 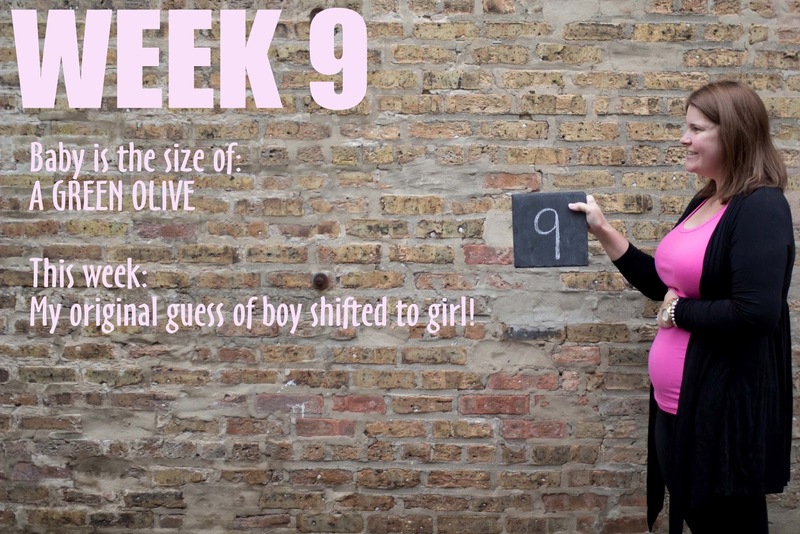 However, getting to the point where you're actually popping out a kid is a totally different story. THAT is crazy town. How do you not know!? This week also brought a major milestone. I finally told work about the baby! I'm normally not such a weirdo - 16 weeks seems awfully long to wait to share - but the reality is that I was feeling anxious about anything going wrong and still wanted some privacy. Telling family is one thing, work felt like another. Granted, we'd already share the news with facebook and the blog, so logic was clearly failing me. Everyone was excited and supportive, and the next phase meant planning with clients. But that's a different post for a different day. Or not. You know, HIPAA and all. I'll let you in on a little secret: these weekly photos are part of a bigger project. Each week, I've been writing a note to baby about what has been happening. Week 15, I had gotten ready for my photo - showered and blow dryed my hair - and Mr. Fix-It shared that he'd been thinking that he wanted a page in baby's book. I couldn't resist: such a sweet request! So, I apologize, you don't get to see my lovely face. But, you know, our kid deserves a book with both parents included, right? Weight Gain: 3-4 lbs. Amen. Movement: None yet, but I sometimes feel "pressure" which I've been told is likely my uterus shifting. Sleep: Not bad. I definitely wake up about 2x per night to use the bathroom, and I'm getting better about being a side sleeper. What I Miss: Occasionally, wine. Cravings: DRINKS! Not booze, but anything liquid. Once I'm thirsty I need to drink immediately. Soda always sounds good, but I don't let into that one often. I try to push a lot of water. Milk, gatorade, chugs of OJ in the middle of the night, smoothies all sound amazing at any given moment. And guess what my favorite thing to eat is? SOUP. So, really, more liquid. Symptoms: None. I am crazy lucky. Best Moment of the Week: Realizing over and over that each day we get closer to meeting this baby! 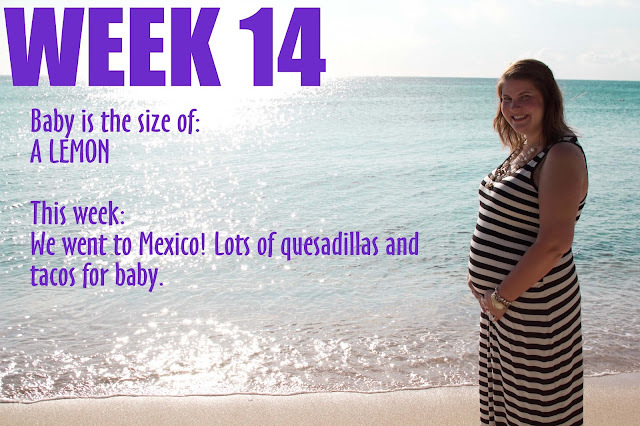 Week 14 meant a trip to Mexico! When I turned 29, Mr. Fix-It asked me what I wanted to do for my 30th birthday. I told him one of two things: If I wasn't pregnant I wanted to drink lots of yummy wine in Napa. If I was, I wanted to go lay on a beach somewhere and do a whole lot of nothing. Obviously, you know how the scenario turned out - and we were off to Mexico at the end of April. 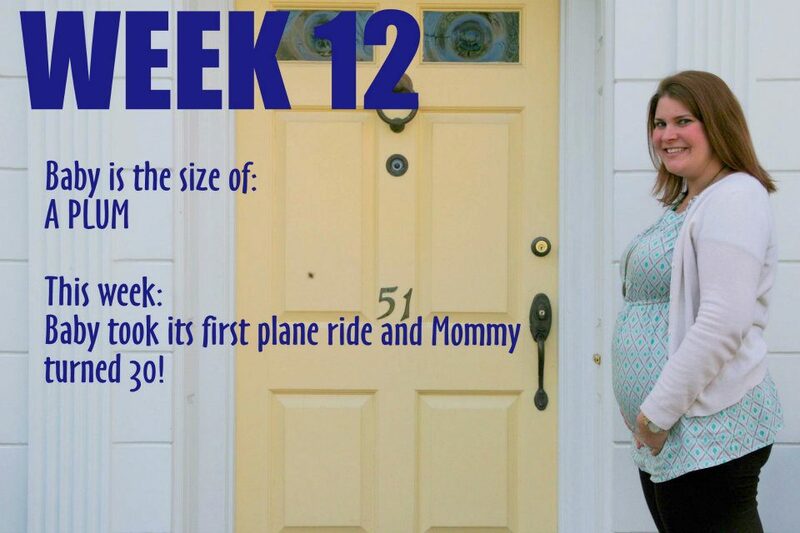 I wasn't too worried about traveling pregnant. The main thing I kept in mind was to stay away from the water. It wound up being fine and I never had so much as a tummy ache. Mr. Fix-It, on the other hand, wasn't so lucky and seemed to pick up a bit of a bug by the end of the trip. Better him than me! We had 5 perfectly relaxing days that we spent at the beach and poolside. I did tons of reading and soaked up a healthy amount of sun. Around this time I was starting to feel that I looked a little pregnant, but some fellow Chicagoan travelers we met at the beach bar (virgin drinks for me!) were happy to inform me that you'd NEVER know. Oh well, I was hoping to look less like a girl with a beer belly and more like a glowing mom-to-be. I'll give it a few more weeks. 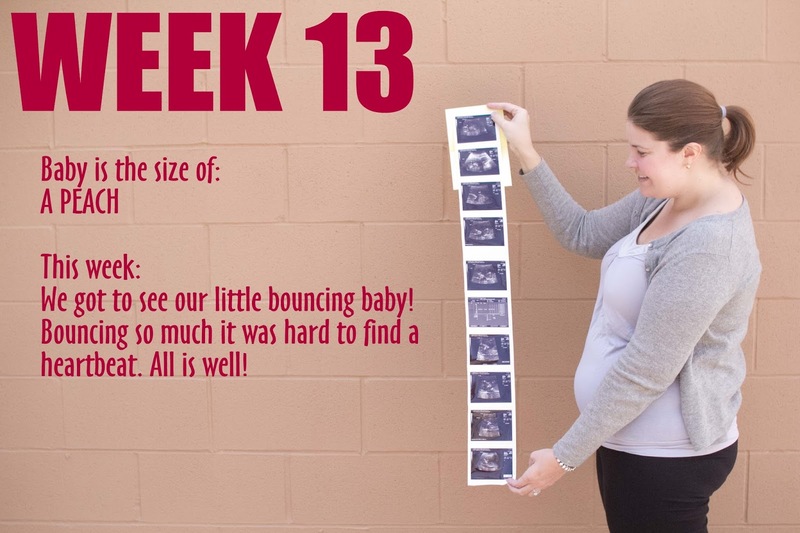 Week 13 was full of appointments! Initially, I was unsure about having a NT Ultrasound performed. Mr. Fix-It and I met with my OB/Gyn earlier in the week, and she convinced us it was worthwhile. For those of you who don't know, it's an in-depth screening for chromosomal disorders. One part is an ultrasound to measure the fluid in the back of baby's neck, and the second part is a blood test. The test ultimately gives you odds, so they estimate your baby's Down's Syndrome risk (and other disorders). The test may tell you the odds of Downs are 1:50 or 1:10,000. It's not an exact science. I hesitated in deciding if the test was worthwhile because I didn't know what I would do with the numbers other than potentially worry. In the end, it was one of the best decisions we've made. All the results came back looking wonderful, which was a great relief. Especially fun, though, was the ultrasound. I had a fantastic tech who was amazingly thorough. She had the attitude of "if we can see it, let's check it out". She was able to look at the heart, brain, kidneys, and even count 10 fingers and toes! It was such an amazing experience. She was even able to make the umbilical cord light up in different ways to show the input and output between my body and the baby's. So cool! She also told me that I have a posterior placenta, which means it is attached behind the baby. This could mean that I had potential to feel early kicks. Unfortunately, (spoiler alert!) at 18 weeks still no magical kicks. I know, I know, it's still early. Having fun following along? We're getting closer to caught up! 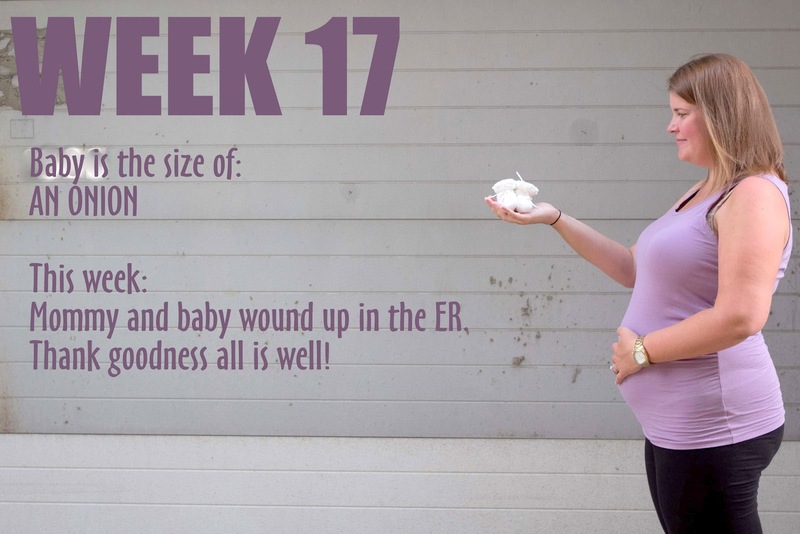 Week 12 was an exciting one all around! Mr. Fix-It and I flew to Providence to celebrate my 30th birthday with loved ones. My parents threw a wonderful party and the weather was just perfect! It was fun to share our baby news with friends and family - especially my sister! I had a small baby toy wrapped that I was going to ask her to keep until the baby's arrival. When she opened it she initially looked annoyed, like, "Why are you giving me some dumb baby toy?" Then I asked her who she thought it was for. She seemed confused ("Why would you hand me a gift that's not for me?" was the look on her face) and then I told her it was for my baby. She was all smiles and excitement! She's a funny one too, sometimes you just get a lukewarm reaction, but she was definitley thrilled. She quickly exclaimed that she "was going to be an Auntie!" and then asked if we'd heard the heartbeat. So sweet. The party was fantastic. It was great to see so many loved ones and have them share in our baby joy. Even though my Mom made it clear that it was a "no presents" event, baby still made out with some adorable gender-neutral outfits, toys, books, and stuffed animals! This kid is awfully smart, it already figured out how to swindle presents. Sadly, this phrase was far too common place in my vocabulary. It would typically happen at work. I thought I was alone in the world with this problem. No one else at work seemed to have this issue. It wasn't until my last job where I finally heard someone else mutter similar words, cursing about an elbow. I felt a huge weight lifted off my shoulders and no longer thought I was an outcast. I spoke to my co-worker and found out he had the same problem all the time. After uncovering another person, I started to see it more prevalent in the work place. The problem I and many others was suffering from is elbow blowout. Elbow blowout is the sudden appearance of a tear or hole in the elbow of a dress shirt. It always seemed to happen completely out of the blue. I was very suspicious of a sharp edge on my desk or somewhere else in my life. This kept happening all too often. My favorite shirts were being attacked mercilessly and the costs of these premature deaths were rising. My luck of finding more people with this problem started my focus on other things that could be causing the problem. We had some things in common like it always happened on the same elbow every time. I stopped being suspicious about my dry cleaner, Mrs. Fix-It (maybe she didn't like the shirt), some random sharp edge, or my arms being too long. It became obvious that it was wear that was causing the blow outs. It happened to our favorite shirts, that we likely wore more often than the others. It was clear that the shirt was a victim of uneven wear. It was getting blown out early because I probably wore my favorite shirts once a week (maybe on accident twice). I always favored these shirts over other for a variety of reasons whether fit, comfort, or style. 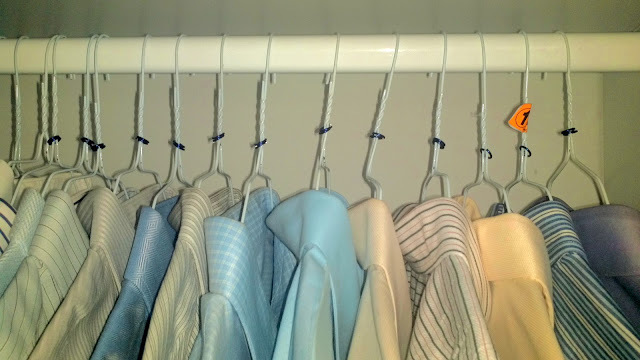 I was also introduced to Gayle King's theory on closets where you should only have "10s" in your closet. The crap shirts I never wore were hiding shirts I might wear and making me only see the ones I always wore. Thank you Mrs. FixIt for leaving Oprah radio on in the car. So when I got a new job, I updated the wardrobe using Gayle's advice. I tossed everything that was not a ten, especially the blown out shirts I was holding on to incase of some miracle. I updated the closet with shirts I would actually wear. This was great! I avoided 15min every morning of standing there flipping through my closet looking for a wearable shirt. They were all good. I noticed though my pattern of choosing the same shirts more frequently then the rest did not change. I also then spent more time trying to remember what I wore and when. I found a solution! I have little wire rings, like 100 of them. When I hang up a shirt I just wore, I put a ring on the hanger. When I go to grab a shirt, I focus on the ones with the fewest number of rings on the hanger. It is too easy, saves me a ton of time thinking in the morning, ensures that I wear my shirts evenly, I don't look stupid wearing the same shirt two days in a row, and NO PREMATURE BLOWOUTS! I also get an indicator on when to launder the shirts. I learned also there is a huge difference between laundering and dry cleaning. It is a lot cheaper, doesn't have the same chemicals so it is better for your clothes, and they press it. I heard dry cleaning too frequently can damage the fabrics. The money saved on shirts can be spent on making Mrs. FixIt happy. Who else has this problem? Do you think my system will make my shirts last longer? 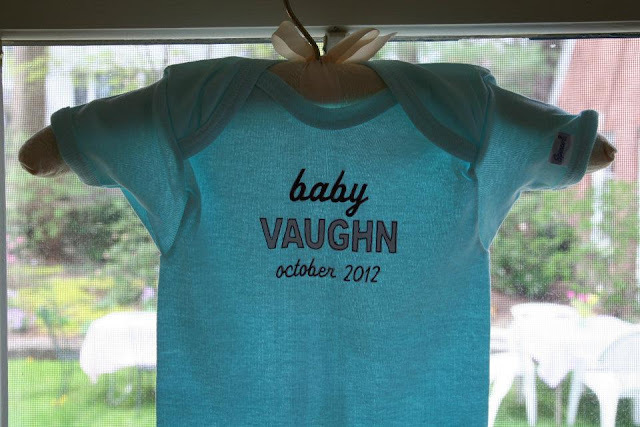 I had a onesie custom made a few weeks prior. We wrapped it in a gift bag and decided we were going to ask a family member to open it. Mr. Fix-It suggested it be his grandmother, though we were a little unsure she would "get it". We decided to hope for the best. 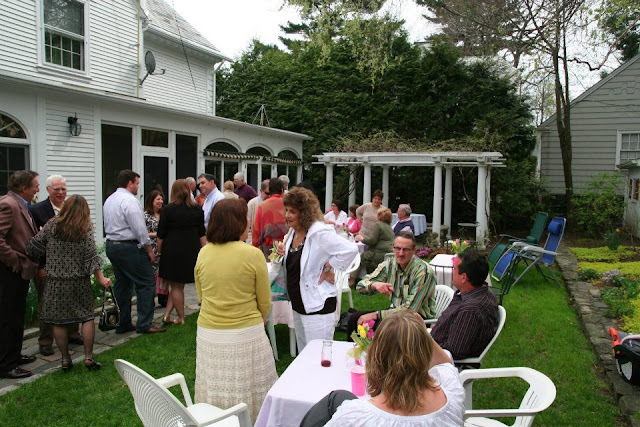 Soon after we arrived, we noticed everyone was gathered in the living room eating hors d'oeuvres. We realized we had found our moment. Mr. Fix-It grabbed the gift bag and I told the group, "We have something that we want Grandma to open, but we think everyone is going to be really excited about it." Grandma begin to lift the tissue paper and quickly said, "No! Oh my god!" in disbelief, and then started crying. We were so thrilled she knew what it was right away! Of course, everyone else was still guessing so the moment dragged out for a while. It was great! Then, she held up the onesie and everyone began to realize our announcement. We were met with lots of "Congratulations! ", clapping, and jumping up and down. 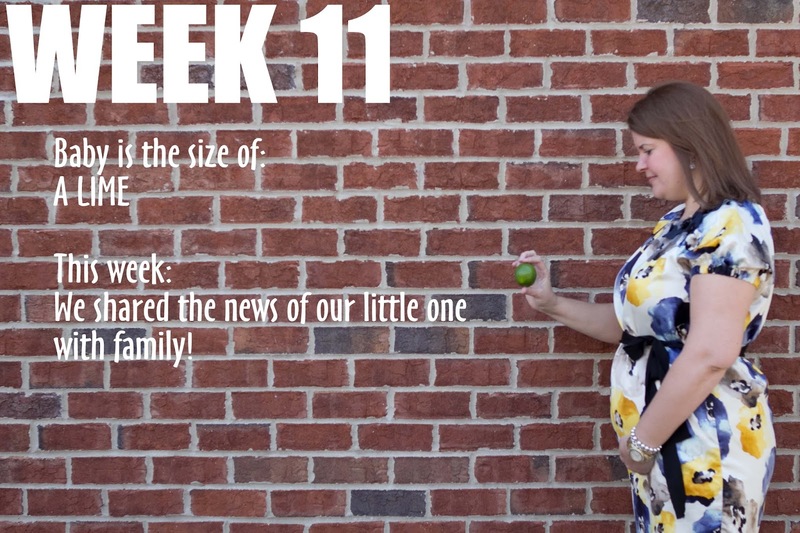 It was the best, most excited reaction, and it was so wonderful to finally share our news! The following weekend we were traveling to Providence where we would get to share the news of baby with my side. Things were really getting fun! P.S. The onesie is a soft green. Not blue! We're not finding out. More on that later! Weeks 9 and 10 were complete opposites. Week 9 was a bit rough. For a combination of reasons, I couldn't sleep through the night that week. We had a bizarre heat wave in Chicago (in March! ), I was getting up to pee all the time, I simply couldn't get comfortable in bed, and I found myself starving - not hungry, starving! - in the middle of the night. Good news was, I didn't feel tired or lethargic during the day. More than anything, I just wanted to enjoy a good night's sleep. Oh well, it simply wasn't in the cards during week 9. Week 10 was a breeze. I felt fantastic and was sleeping again. No more standing in the kitchen eating cereal at 4am! That week we also celebrated Mr. Fix-Its 33rd birthday. It was a nice change of pace to get dressed up and head out for the evening, because we'd been pretty low-key over the past several weeks. I'm not a huge drinker, but having a fancy meal sure does make you crave a good glass of red. Oh! And I just remembered a funny story from around this time. Mr. Fix-It and I went out with friends for dinner and then made our way to a local bar. I played the, "Oh, I don't know what I want yet" card and then several minutes later sent Mr. Fix-It to get me a vodka sprite (hold the vodka) wink wink. I was proud of our covert operation until I took a GULP. Booze! Ugh. I had taken a serious sip. It was, in fact, the bar tender's fault. He had handed Mr. Fix-It the wrong drink, while my virgin-faux-booze sat on the bar. Sorry, little baby, it was an accident. Oh, and I should add, I then proceeded to chug gobs of water to dilute alcohol intake. Poor child. Happy Mother's Day to all of the wonderful mothers out there, especially my own! thanks for giving me the greatest title I could imagine. Week 7 brought one of the biggest milestones yet: We got to see and hear baby's heartbeat! It was the most magical thing to see this little flutter on the screen. When the nurse turned on the doppler sound Mr. Fix-It really lit up. I think it was the closest we have felt to the baby - to see and hear that there was a real live little embryo with it's own beating heart was just unbelievable. Baby's heart was chugging away at a steady 148BPM. We got to leave that day with a few ultrasound pictures again. It was definitely one of my favorite days yet. Week 7 was also a hurdle because it meant that we were ready to be discharged from the care of fertility doctors and I could go to my Ob/Gyn. I was extremely excited about this shift. Later that day I made an appointment with my doctor and scheduled my "first" prenatal appointment. I also felt like such a cheater - most people hadn't seen their baby yet and we already had 2 ultrasounds and a confirmed heartbeat! Trust me, I didn't mind being a cheater though. 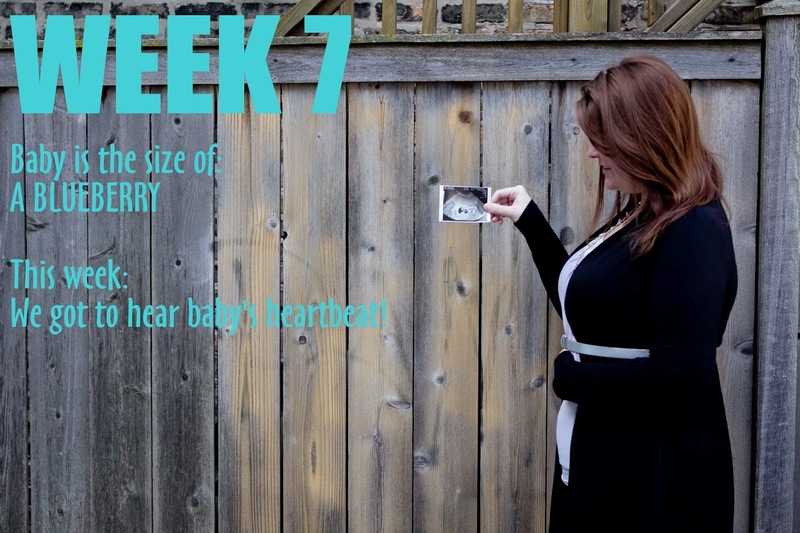 At this point, (and at present) I felt so blessed and lucky that I had felt wonderfully healthy through the pregnancy process. For me, the biggest challenge during this time was psychological. I'm sure that stories of miscarriage always exist, and it's just that you listen a little closer when you're expecting. But it starts to seem as if they are everywhere, and you can't help but worry. It is just this constant low-grade fear that you have to carry in your mind at all times. 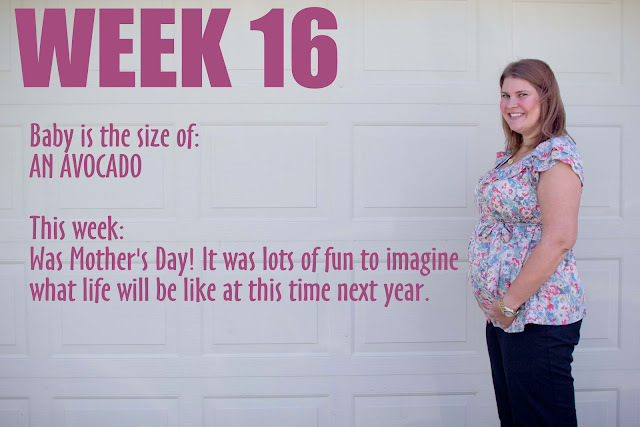 The first trimester is so exciting, and so stressful at the same time! I would say that 90% of the time I felt calm and hopeful, but 10% of the time I would google the most ridiculous things for reassurance. I guess that's all fair preparation for motherhood! 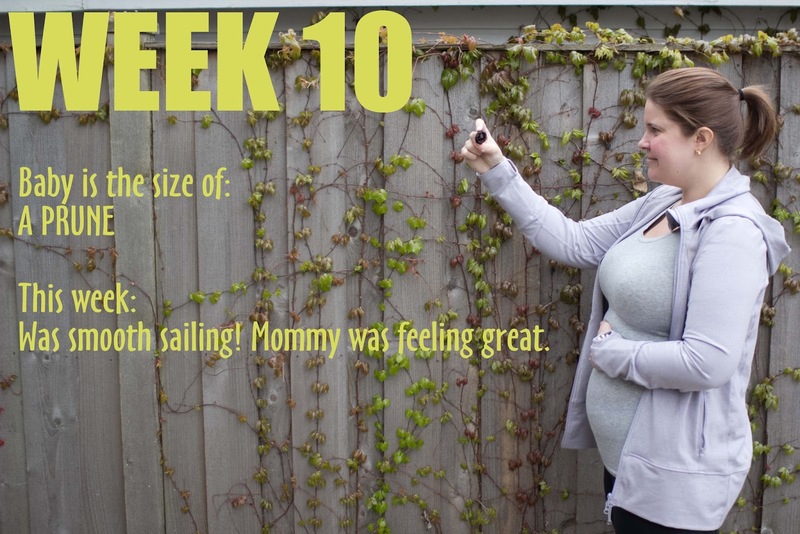 Weeks 5 and 6 were smooth sailing. Some would say that it was too early for any real symptoms at this point, but I chose to believe that I was going to get an exemption from morning sickness and nausea. Lucky for me, that proved to be true! I reasoned that my history of "tummy troubles" rendered me as having already put in my lifetime dues of feeling sick and icky. Of course, that's not how these things actually work. A girl can hope, though, can't she? There are a lot of things you assume will happen during pregnancy that I was finding to be not at all true. During this time I felt great - completely normal actually - and didn't have any major, obvious, everything is changing type feelings. I thought everything would be different - especially how I thought and how I felt. Wasn't I supposed to be hugging a toilet and super emotional? And craving things? On the other hand, one thing I didn't entirely expect was an overwhelming sense of wanting to LOOK pregnant immediately. 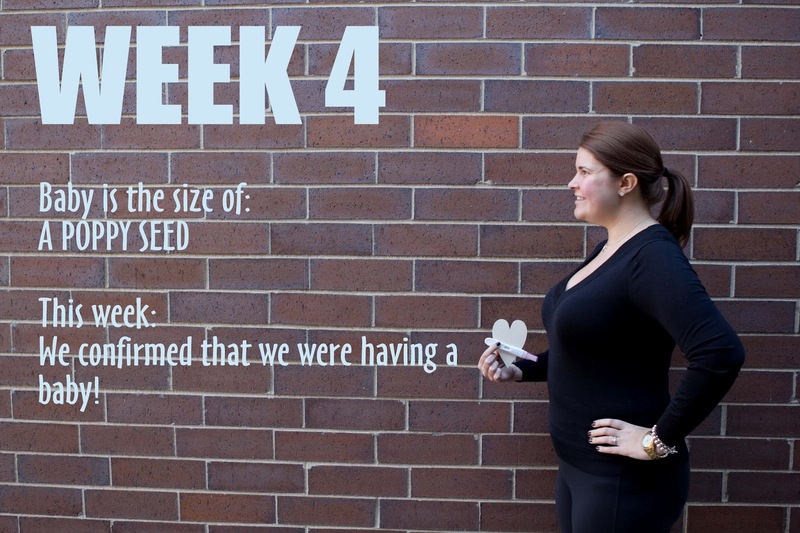 I was willing my bump to grow because I wanted it to seem more real, and I wanted the world to know. But when your baby is only the size of a sweet pea, you have to be patient. 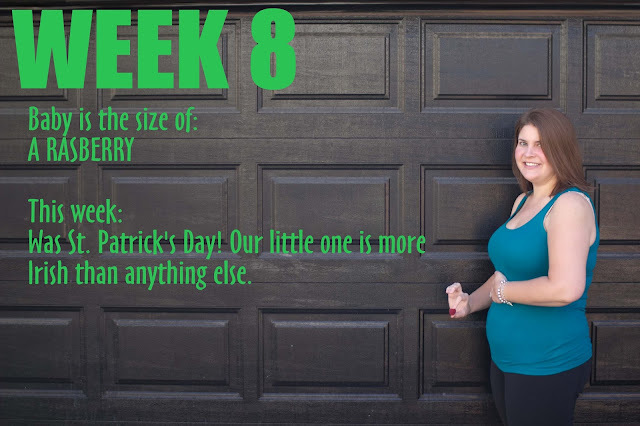 I will confess that by week 6 I was rocking a Bella Band. This was pretty ridiculous. If you look closely in the photo, you can see the black layer peeking out. In reality, my jeans buttoned just fine and I had no signs of a baby bump whatsoever. In my defense, my jeans did start to feel uncomfortable by the end of the day (likely baby bloat) and I didn't want to squish the little munchkin. Mr. Fix-It rolled his eyes at me many times during this phase. Looking back, I can't blame the man. But I was just so excited! 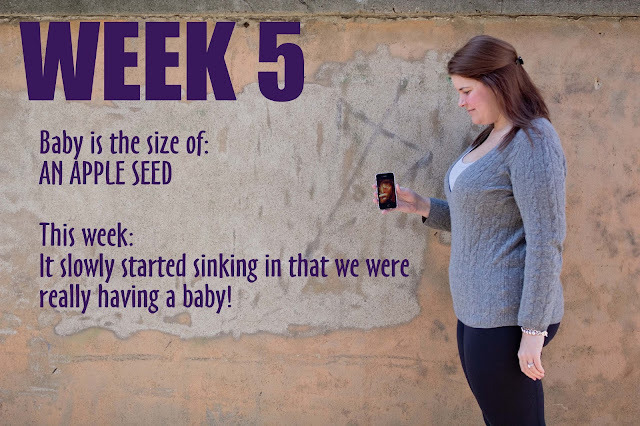 With week 6 also came a significant milestone. At the beginning of the week the pregnancy was confirmed via ultrasound! The doctors wanted to be sure that the baby had implanted properly, and that the location of implantation was compatible with pregnancy. If the embryo was in one of my fallopian tubes the pregnancy would be considered ectopic and not viable. Also, it is possible to have a "chemical pregnancy" where the hormones are present (confirmed by blood work) but the sac is empty/an embryo has failed to develop. Even though I was not especially worried that anything would go wrong, it was a huge relief that everything looked great! We had a sweet little blob doing exactly what it was supposed to do and our very first ultrasound picture. Valentine's Day 2012 fell on a Tuesday. Mr. Fix-It is in class Tuesday nights, and we knew we would have the results of a pregnancy test (confirmed via blood work) Friday, February 17. It only made sense to hold off on our Valentine's celebration. Plus, I reasoned that I'd either want to celebrate or drown my sorrows in lots and lots of wine. February 17 was a night I will always remember as one of the most exciting of my life. The day? Oh lord. I now understand one of the best purposes of a home pregnancy test. QUICK RESULTS. Going in for a blood test at 7:30am and not receiving results until almost 4pm: torture. But I refused to "cheat". Sure, I could have taken a home test. But a blood test was advised and I knew the results were going to be accurate. Plus, a part of me wanted to keep the hope alive that I might be pregnant for as long as possible. I scheduled myself for a full morning of clients. I was able to maintain focus, but once 12pm rolled around I was a basket case. I cried no less than 7 times that day, watched for "signs from the universe", and stared blankly at my computer screen for hours. When I finally couldn't take it any longer, I hopped in the car. But then I realized that I couldn't get out of the car because "What if the results came in while standing in line somewhere?!" So, I parked in a Starbucks parking lot. I sat. I texted. I cried. I gchatted. I scrolled through facebook and twitter a hundred times. And then the phone rang. Doctor's office. I'm pretty sure my heart stopped. I swear the nurse dragged out the news. "Amaaaaaaanda? How are you doinggggg?" Oh god, was she checking my mental state before delivering bad news? I had a hundred thoughts in a second. Clearly she was making sure I wasn't standing on a bridge. "Well, we have the resultsssssss. They just came innnnnnn...." Speak, woman, speak! "So, I'm calling to tell youuuuuuu...that you are pregnant!" I was frozen, shocked, relieved. I quickly scribbled down my hormone levels and thanked her repeatedly. I hung up the phone and sobbed. Sobbed like a crazy lady. Finally, hands shaking, I called Mr. Fix-It. I guarantee that when he heard my shaky, sobby voice his heart sank. "Honey...." (sniffile, sniffle, cry) "...you're going to be a Daddy". I had the words planned in my head all day. Getting to say them was beyond amazing. I don't even remember what he said in response. I know he was sitting in a cubicle at work, so he couldn't say too much, but he was thrilled. I called my Mom and a few best friends, and then hopped on the highway. I was smiling, daydreaming, laughing, crying, thanking the universe, and trying to let it sink in that I was truly pregnant. I don't remember much else from that night. It was all a blur of happy, ohmigod, this-is-really-happening type moments. Mr. Fix-It and I sat at dinner, enjoyed the most delicious meal, and were almost literally pinching ourselves in excitement. I believe there is such a thing as a blessing in disguise. When we heard the news, though, "a blessing" was the furthest thing from our mind. Gut-wrenching, painful, "why us? ", was more like it. Several months ago we were told that we had a four percent chance of conceiving a baby naturally. This information was a blessing. And once we realized it, we could prepare for our future. We could make a plan; we could ready ourselves for a tough road ahead. Most couples try to conceive for a year before receiving a referral to a fertility specialist. 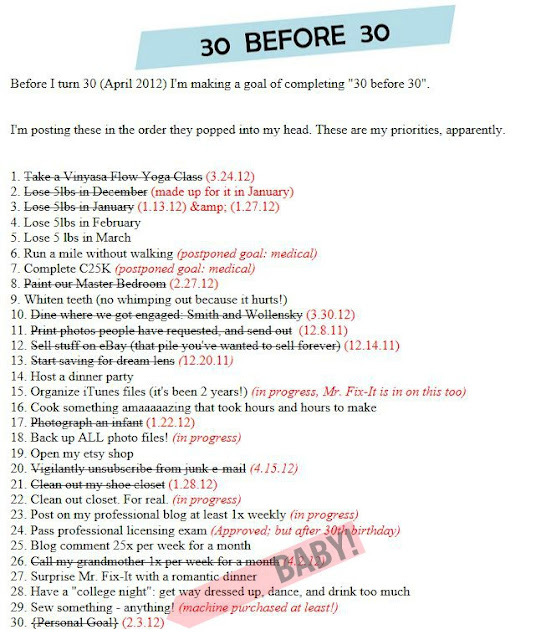 All of this information came our way before we even started trying to get pregnant. We were fortunate that a hunch led to a simple blood test which led to a diagnosis, that led to more testing, that led us to the fertility specialist who delivered the hard facts. The same fertility specialist who made our baby a reality. I never knew I could hate and then love a stranger so much. So the blessing, undoubtedly, was knowledge. Knowledge that spared us from cycle after cycle of pain. There were times when I could not tell whether infertility was breaking us down or building us up as a couple. The reality is, it did both. We shared some of our darkest, most angry, most vulnerable moments and also found deep strength in sharing our complete dedication to the process and the end result. A baby. OUR baby. Sparing the exact details of our diagnosis and treatment, I will say that we were also blessed that we got pregnant very quickly. And for that, I couldn't feel more fortunate. 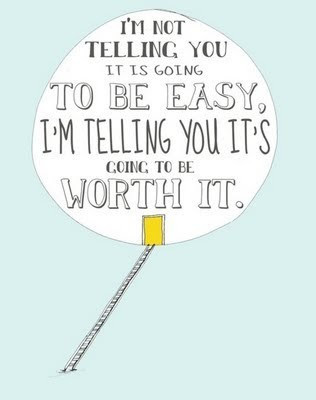 It may not have been easy, but it is completely, overwhelmingly, wonderfully worth it. Overall, I'm happy with how this turned out! I probably could have pushed myself harder to accomplish more, but I'm not losing sleep over it. 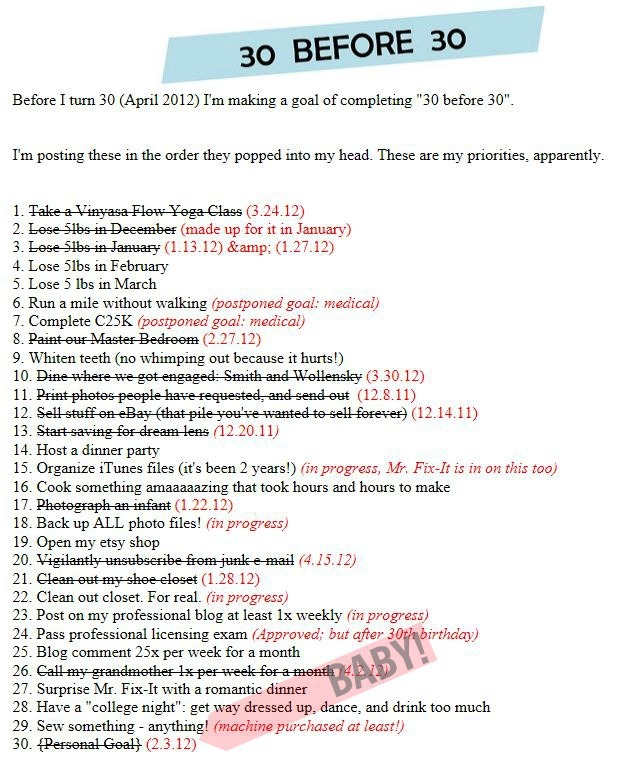 And, at very least, I still have a number of goals that I am still looking forward to completing.